In the last couple of years, I’ve stopped downloading music in favour of streaming services. I had, and still have, a 6000+ song collection in my mp3 player (the best one ever made: iRiver H3XX, self-upgraded several times), but since I listen to music mostly while working, I moved on to streaming services. These services gave me a lot of new music, most (but not all) of the old one I already had and sometimes a few extra perks. They changed the UI very recently, and it’s looking even better, but I’m having some problems with the chat part. Last summer I decided to give Spotify a chance, mainly due to them having a lot more recent music, and some very nice ready-made play lists. The problem were the extremely annoying adds! Nevertheless, by the end of 2014, that was the service I was using exclusively. At that time, they launched a promotion, giving 3 months of premium membership for €0,99. It was the perfect excuse to try premium perks for the first time. So, fast forward 3 months, and I know I’m not going to renew the membership. While not having adds was very good, the rest of the perks were things that I actually don’t use! If they ever create a tier where only the adds are removed, I may come back. And then there’s Google Music. I never really used until I decided to double the size of my mp3 player hard drive. Since I needed some way to transfer the music between drives, instead of just saving to a portable drive, I uploaded it to Google Music. Now I have my collection available everywhere, and I’m currently downloading it back to the new drive. 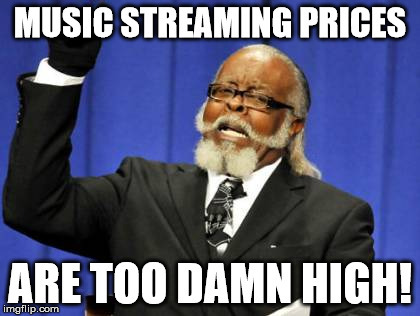 So, long story short, paying for music streaming is not for me (in it’s current form), as the prices are too (damn) high for my use case. After Spotify’s trial is over, I’ll probably get back to Grooveshark, but try out Google Music too.